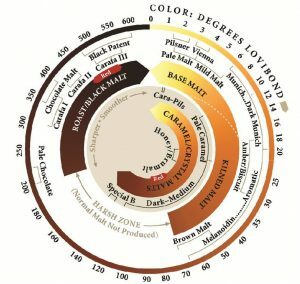 This week I take a look at “harsh zone” malts in the roughly 70-200L color range and how they can upset the balance of an otherwise perfect beer. A while back I did a review of Randy Mosher’s Mastering Homebrew book. The book, which I highly recommend, introduces a number of new concepts in balance and flavor of beer recipes. One of the most important concepts he talks about is the observation that relatively few malts are produced in the 70-200 L range. The reason for this is very simple: many of the malts in that color range can produce “off flavors” or harsh notes in the finished beer. So let’s take a look at the “Harsh zone” malts and how to properly use them in your beer. As illustrated in the graphic to the right (click to make it larger), the harsh zone is defined as malts having colors between roughly 70-200L. The most commonly used malts in this range are dark Crystal/Caramel malts including Crystal 80L, Crystal 100L and Crystal 120L. In addition, “Special B” is a very dark Crystal malt roasted to about 140-150L. Some dark Brown malts from the “Colored malt” group also fall into this group, as does the roasted malt “Pale Chocolate”. If used in large amounts these harsh zone malts lead to acrid, bitter, burnt-toast, burnt marshmallow and other undesirable flavors. A common beginner mistake, for example, is to add some Crystal 80L (or darker) malts to something like an English brown ale to darken the color. The result is often a harsh finish to the beer that can make it quite unpleasant. This is particularly common for extract brewers who tend to use dark crystal malts and light roasted malts interchangeably. Brown Malt – A kilned malt that was once the primary ingredient in Porter, but is now rarely used. While not as harsh as dark crystal malts it does take on a mocha-coffee, deep toast or chocolate overtones and can also have some campfire character. Caramel/Crystal 70-80L – These have an intense toasted character similar to burnt sugar or toasted marshmallow, as well as some caramel character. Used in appropriate amounts they can also bring forward a dried fruit (raisin, fig or prune) character, but unfortunately they are often overused leading to harsher toasted flavors. Caramel/Crystal 100-120L – These have an intense roast sugar flavor, and can be bitter with a Turkish coffee finish. In small amounts you can get a toasted raisin finish, but overuse will lead to acrid bitterness and burnt flavors. Special B – Technically a very dark Belgian crystal malt of around 120-140L, it can have character and flavors similar to both very dark caramel/crystal malts or alternately the light chocolate malt. Like dark crystal you will get strong burnt sugar flavors, and acrid bitterness from overuse. Used sparingly you can get toasted raisin, or even a cherry or plum note from it. Light Chocolate Malt – Many brewers are surprised to find out that chocolate malt gives a piercing coffee like roast flavor to beer that is actually sharper than black patent malt. Light chocolate malt, with its position on the edge of the harsh zone, is even sharper and more piercing that normal chocolate malt. While harsh zone malts can easily overwhelm a beer recipe, used in the right quantities for the right style of beer, they can actually add depth and complexity to an otherwise boring beer. For example, I’ve often used combinations of small amounts of harsh zone malts for a Robust Porter to add depth. So how much is enough? Unless you are going for something really over the top in terms of flavor, I would suggest limiting most harsh malt additions to 2-5% of the total grist bill, and probably no more than 10-12% of total harsh malts. 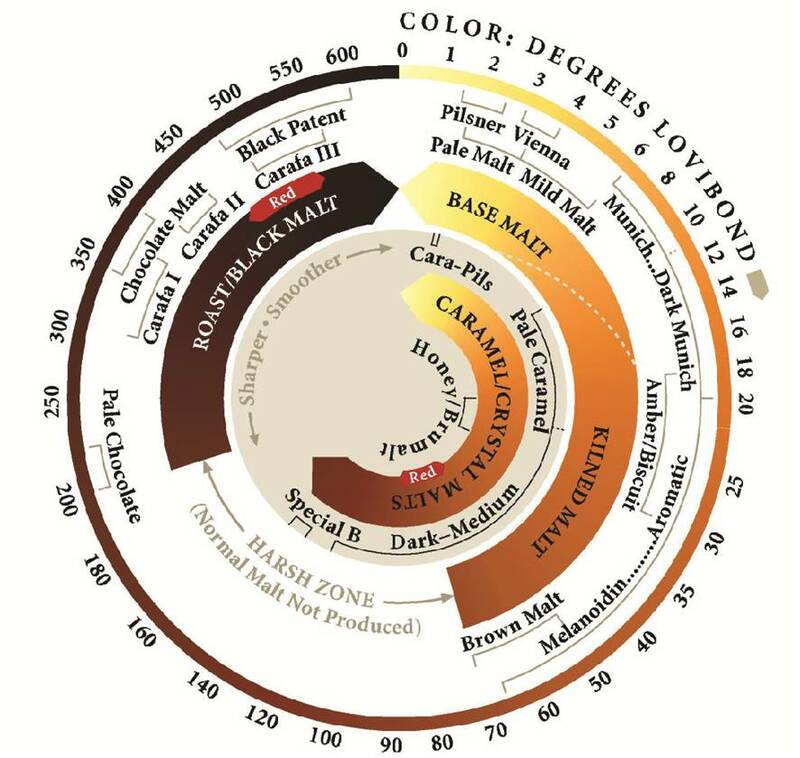 My personal preference is to use only one harsh zone malt and combine it with other malts from outside the harsh zone to get flavor complexity. Too many harsh zone malts in a single beer can have a multiplicative effect, resulting in an unbalanced beer. By limiting the harsh malts used you can add plums, mocha, cherry, dark fruit and raisin notes without the bitter burnt coffee/toast/marshmallow flavors coming through. The style you are brewing is also critical. While harsh zone malts might be appropriate in a robust porter, stout or dark Belgian beer, they would certainly be out of place in many other beer styles. Consider the flavors you hope to add with the harsh malts and select other roast or colored malts that will complement that flavor. Hopefully you enjoyed this week’s article on harsh malts and can use them to add depth to your beer. Thanks for joining me on the BeerSmith Home Brewing Blog. Be sure to sign up for my newsletter or my podcast (also on itunes…and youtube…and streaming radio station) for more great tips on homebrewing. Also check out the How to Brew Video series I shot with John Palmer if you want to learn more about all grain brewing. The tease of the beer depends on the color of the beer itself, according to my friend who work’s in a company the produces beer.